The summer of 1971 had been busy for Jim. He started with live appearances with Nancy Sinatra as part of her Las Vegas stage show, ventured cross country for a multi-stop family vacation, and began work on his next television special, The Muppet Musicians of Bremen. 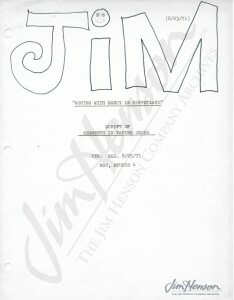 At the same time, the songs for the Sesame Street “Muppet Alphabet Album” were coming together (to be recorded in September), and Jim headed into the ABZ studio at the end of August to tape Muppet inserts for Sesame Street’s third season. But before the Sesame session, Jim, Frank Oz, Jerry Nelson and John Lovelady flew out to Los Angeles to rehearse and tape material for a Nancy Sinatra television special related to their appearance earlier that summer. In 1967, Sinatra had produced a TV special called Moving With Nancy and hoped to make additional ones in the same vein. For the program, at NBC’s Los Angeles studios, they taped the same pieces from the live show including “Fortuosity” and “Mahna Mahna”. Unfortunately, the special was never completed and the material taped for it remains in Nancy Sinatra’s vaults. Learn more about Jim’s live appearance with Nancy Sinatra in Las Vegas. 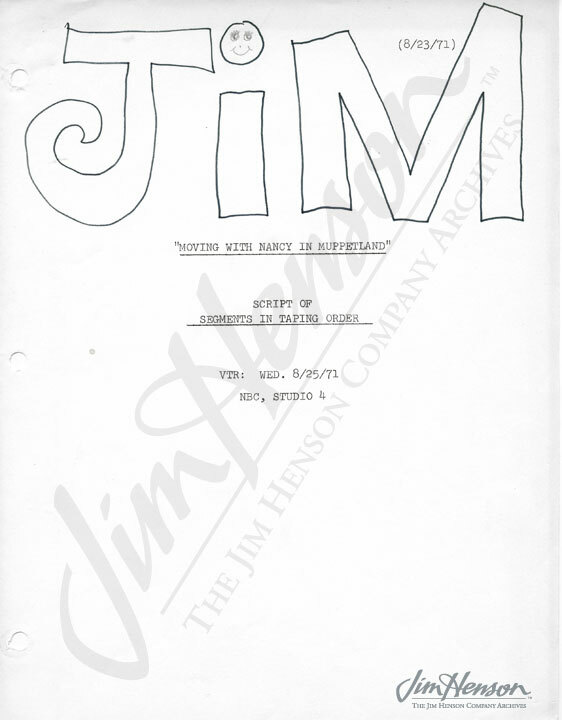 Script cover page for Moving with Nancy in Muppetland, 1971. 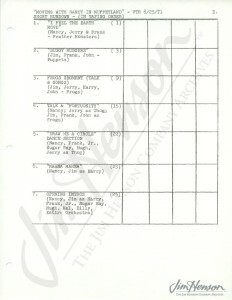 Rundown for Moving with Nancy in Muppetland, 1971. 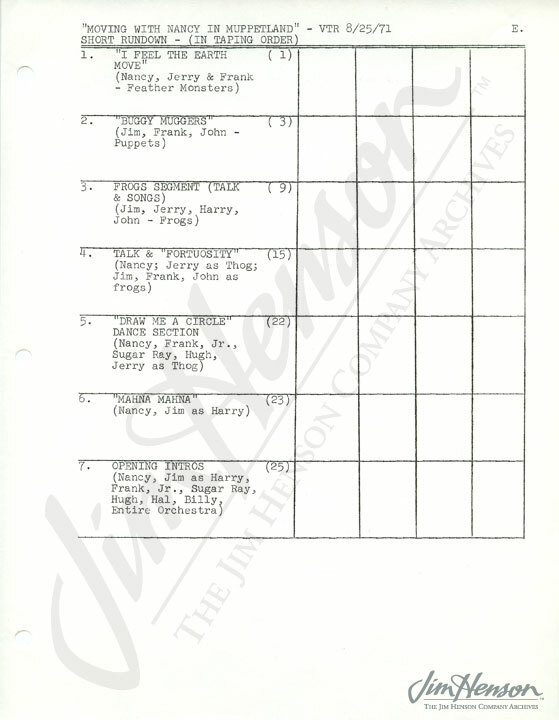 This entry was posted in 08-August '71, 1971, Appearances, Muppet Musicians of Bremen and tagged Frank Oz, Jerry Nelson, John Lovelady, Las Vegas, Moving With Nancy, Nancy Sinatra, Sesame Street, The Muppet Musicians of Bremen. Bookmark the permalink.